We’re a couple of mums. Our names are Katherine and Carolyn. Three years ago, we got involved in a campaign called Fair Funding for our Kids, set up by Glasgow mums who were frustrated they couldn’t access their free childcare hours. When those original mums moved on from the campaign, we moved in to run it. We had to – both of us had experienced the bewilderingly foggy world of pre-school childcare, and both of us were keen to improve it. Did we succeed? Well, yes and no. – Nine out of ten parents who wanted to change their working situation said that finding appropriate childcare was the biggest barrier. And there have been positive changes. Councils are, gradually, moving away from the hated half day place. Our first survey, in 2015, found that 98% of all council nursery places were for half days. By the time of our final survey, in 2018, this stood at 68%: a reduction of over a quarter. And of course, there is the Blueprint: the Scottish Government document which promises that, by 2020, the entitlement will be 1150 hours and funding will follow the child, meaning parents can place their child in any nursery which meets their needs. In theory, this should spell the end of the half-day place for everyone except those it genuinely suits. We are proud of our record. But have we achieved everything we wanted to? Not by a long shot. We hoped to see much faster change. We are acutely aware that there are still many parents being offered 9am-12.10pm places that they cannot make use of, therefore missing out on their funded hours. 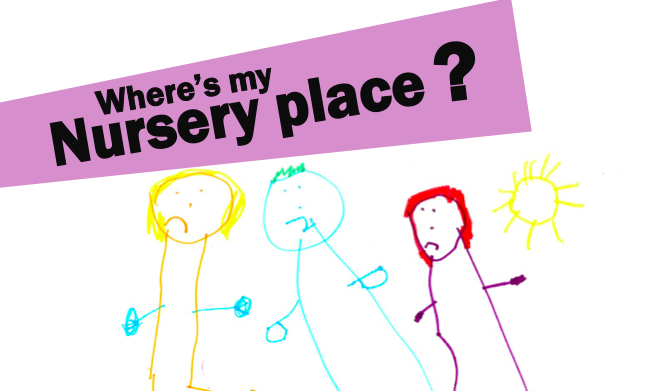 There are still parents who need their child to go to nursery in a different council area than the one they live in, but cannot get any local authority to accept responsibility for their needs. And there are plenty of parents who are just bamboozled by the whole impenetrable patchwork of local childcare services, and can’t understand why it needs to be so complicated. To all those parents, we are sorry we couldn’t persuade politicians to fix the system in time for your child. We did try. And we are grateful to all of you who spoke out in support of our campaigning. So many parents – far too many to name – let us quote them in press releases, blogs and tweets. Others appeared on the radio and TV, usually for the first time, conquering their nerves in order to speak up for themselves and their peers. This campaign would literally have been nothing without you. Thank you. We’re grateful, too, to the journalists who took the time to listen to us. The problems with half-day places are neither easy nor quick to explain, but we never struggled to get a hearing from the media. And thanks are also due to the politicians and civil servants who did listen, and raised our issues repeatedly in parliament and in government meetings. We think now is the time to call it quits. With the 2020 deadline just a year away, it’s hard to focus attention on the problems that still exist in our childcare system. And by 2020, neither of us will have kids in nursery anymore. – A minimum hourly rate to be paid to providers by local authorities. It won’t be for us to follow up on these expectations: we’ll be navigating a new world of schools, exams and parents’ nights. But we have no doubt, if the promises of the 2020 Blueprint are not met, there will be a new group of parents who will get together around a kitchen table and decide that enough is enough. If this experience has taught us anything, it’s that parent power is real. We are not throwing away the experience of Fair Funding for our Kids. We’re just putting it aside, ready for the next generation. Fair Funding for our Kids has found that two out of three children attending council nurseries get care for just three hours and ten minutes per day. Response to our recent FOIs found that 68% of council places were offered for half days only. This is an improvement on Fair Funding’s first FOI report in 2015, when the figure stood at 95%. However, at this rate of change, it will take until 2026 to end the practice of half-day places. 70% of all free childcare places for 3-5 year olds in Scotland were offered in council run nurseries. “Early years care is so important, but working parents continue to miss out. Very few people have bosses who are prepared to let them work for less than three hours a day, and many don’t have grandparents who can fill gaps in childcare. We need much faster progress in eliminating half-day places except where parents specifically request them”. Fair Funding for our Kids Research shows nine out of ten parents who want to change their working situation say the main barrier is lack of appropriate childcare. And more than two-fifths of parents are dissatisfied with their childcare arrangements. The findings are revealed in a new report based on a survey of over 400 parents. But half of parents who were unhappy with their childcare arrangements said it was because the hours available were too short or did not suit their working arrangements. This is largely because most councils only offer free childcare hours in slots of 3 hours 10 minutes during term time only, with no option for parents to buy extra hours for the rest of the day: an unusable system for many working families. Research by the Fair Funding campaign in 2016 found that half of all nursery places in Scotland were for half days only. The report, Beyond the Half Day Place, also reveals fifteen per cent of parents are receiving no free hours at all for their 3 or 4 year old. This follows a 2015 Care Inspectorate report which found a third of 3-4 year olds were not receiving their funded place. The Scottish Government plans to increase the entitlement to 1140 hours by 2020, and has published a blueprint setting out how it will achieve this by providing more flexible childcare. But campaigners point out today’s nursery age children will be at school by 2020, and are demanding immediate action. Today we reveal that most councils are not following Scottish Government guidance on cross-boundary funding of free childcare places. Our new report based on FOIs shows just four Scottish councils have reciprocal agreements with every other local authority to fund childcare for children from other areas. Yet Scottish Government guidance says that all councils should have such agreements. This affects parents who live in one local authority area but need their children to go to nursery in another: usually because they cannot get home from work in time to pick their children up before nursery closes. We’re calling on the Scottish Government and COSLA to create a national agreement on cross-boundary funding. Two-thirds of nursery places in Scotland are half-day only, Fair Funding for our Kids has revealed. And nine out of ten council places are only offered for half days, making them almost unusable for most working parents. These and other findings are in our new report, based on Freedom of Information requests submitted to every local authority in Scotland. You can also check out every FOI response we received, to see what your local authority told us. Thousands of families in Scotland are unable to access their legal entitlement to 600 hours free early learning and childcare for 3 to 5 year olds. We are acting to find out where this is happening and why. Help us change things for the better. Join our campaign for fair funding! The Fair Funding campaign group. A straightforward guide to the key issues. If you are a parent or carer of a toddler, read on. Families share stories of their unfair childcare funding experiences. Steps you can take to improve the situation. Media coverage of the campaign and childcare issues. Information about our flagship campaign in Glasgow. Easy, one-click poll: is your child getting their nursery funding?